Geology is the study of the history of the Earth, including the study of volcanic and metamorphic rocks and the strata that make up the sedimentary rocks. Fossils and chemical evidence tell us the story of life on Earth over 3.7 billion years. Geology includes the study of soils and groundwater, and the physical and chemical processes that formed the landforms at the surface of the Earth and other planets, like Mars. Sedimentary sequences contain the coal deposits and most of the oil and gas reserves. The present and future are bright for Earth scientists. You can be an integral part of our energy future, and help to better understand and protect our infrastructure, environment, and water resources. Our energy and environmental future is up to YOU! For important information and answers to questions you may have about the department, degree program, courses, and major requirements, contact Dr. Chris Coughenour (Email: clc235@pitt.edu; phone: 814-269-2945). News from the Red Planet - Methane Outgassing on Mars and the Continuing Journey of Curiosity! Over the last 15 years, a growing body of evidence reveals methane production is occurring on Mars. 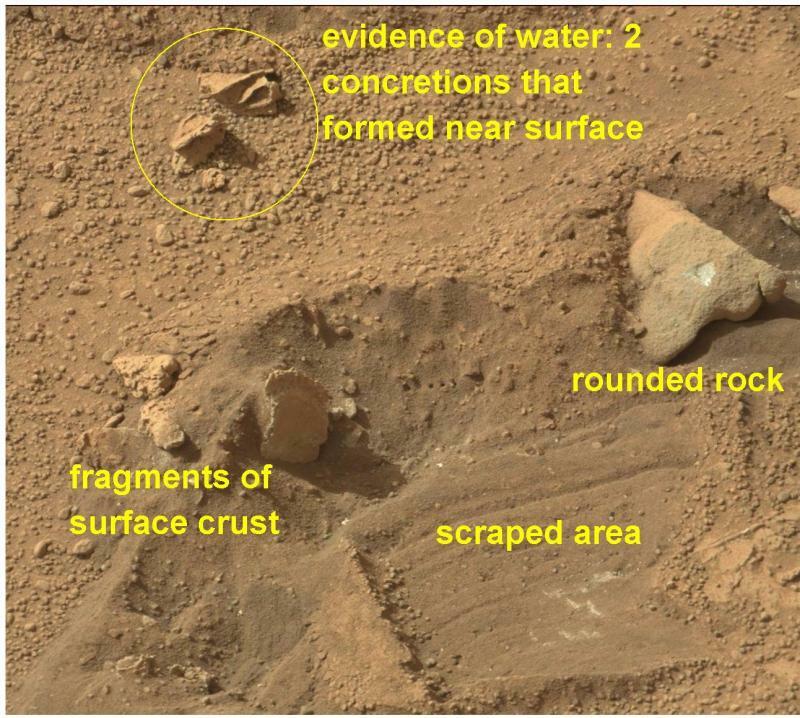 It has been detected from Earth, from orbiters, and is routinely "sniffed" in the atmosphere by NASA's Curiosity Rover. Most methane produced on Earth is of organic origin, but some inorganic processes can also produce the gas, related to volcanism. The frequent detection of the gas at the surface provides an intriquing target in searching for possible extant life on Mars. As of summer 2018, Curiosity has been exploring the interior of Gale Crater for 6 years. Sedimentary rocks are abundant in Gale, demonstrating that water was once abundent there, forming a lake that may have formed, evaporated, and reformed multiple times. Gale lies on the dichotomy boundary, at the edge of what was likely an ocean that filled the northern plains of Mars in Noachian time. 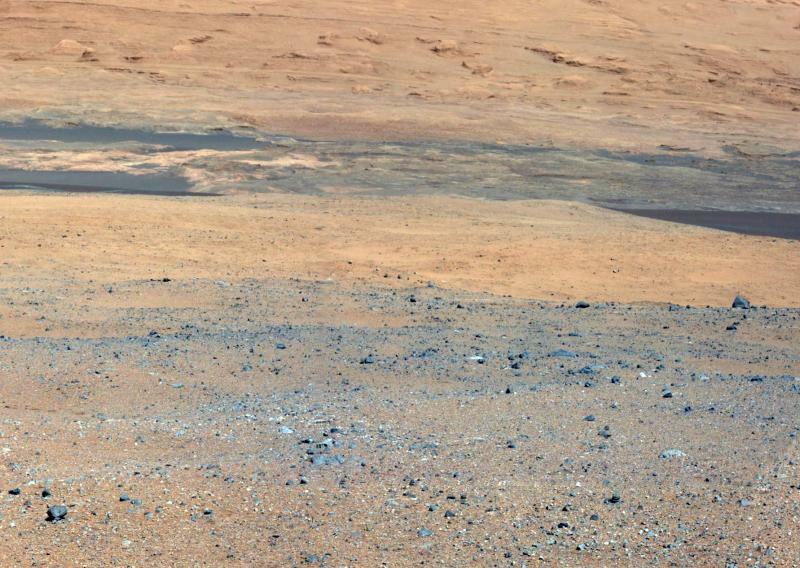 It appears this northern ocean intermittently spilled over into Gale Crater. The sedimentary units that formed in response preserve a physical and chemical record of that ocean and the paleolake in the crater. Below is Curiosity's panoramic view of Mount Sharp, a central peak of layered deposits inside Gale Crater (Sep 2015). Geophysics instructor Neil Coleman has published a "Mars Mission Concept — Resource and Science-Rich Targets for Human Landing Sites" [#1157]. Slightly expanding the latitude limits for landing sites on Mars can ensure astronaut access to rich ice deposits, essential for both safety and science and for establishing long-lived research stations for human explorers. The ice deposits also serve as a repository of the climatic and volcanic history of Mars extending over the last 100 million years or longer. In July of 2016 the Department of Energy and Earth Resources lost Emeritus Professor Uldis Kaktins, a beloved professor who touched the lives of thousands of students at UPJ. Starting in 1975, more than a hundred geology majors were inspired by him to pursue careers in the Earth sciences. In 1891 a report was published by an American Society of Civil Engineers committee to investigate the cause of the Johnstown flood of 1889. 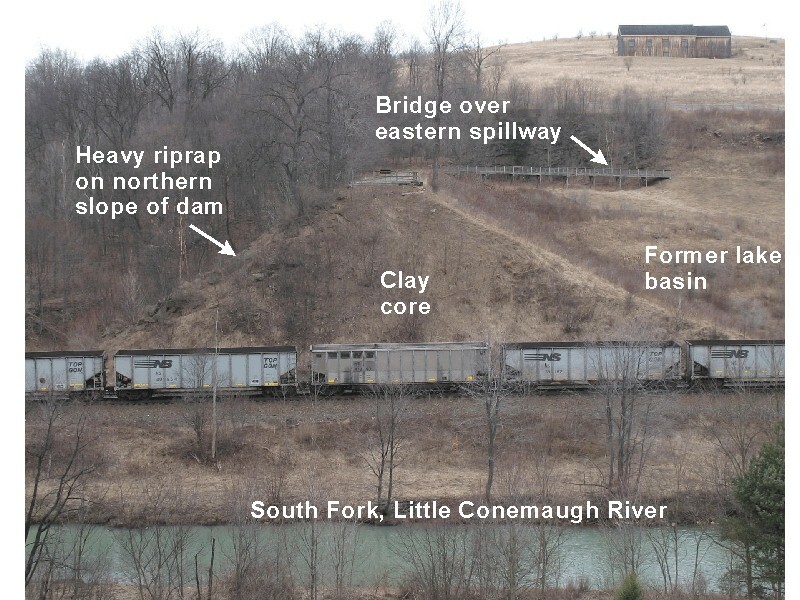 They concluded that changes made to the dam by the South Fork Fishing and Hunting Club did not cause the disaster....We dispute that conclusion based on hydraulic analyses of the dam as originally built, estimates of the time of concentration and time to peak for the South Fork drainage basin, and reported conditions at the dam and in the watershed. 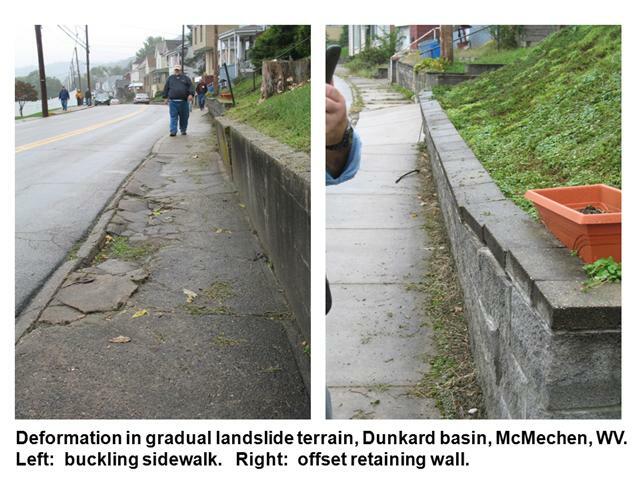 We contributed our new information about the 1889 flood at the September 2016 Field Conference of Pennsylvania Geologists. We also presented this information at the Denver meeting of the Geological Society of America. 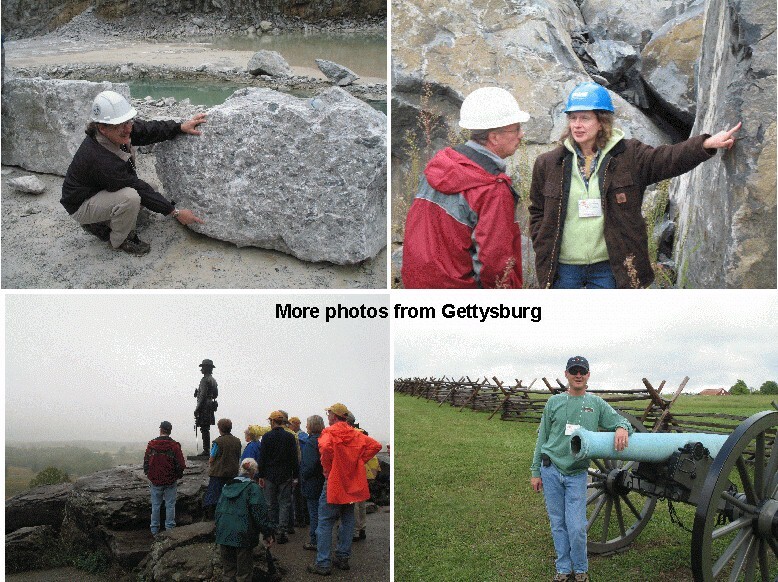 Below are images from the 2015 Field Conference of Pennsylvania Geologists. What you see is active venting of smoke and steam from the long-active underground coal seam fire at Centralia, PA. Additional information is available at this link: http://fcopg.org/history/guidebooks﻿. 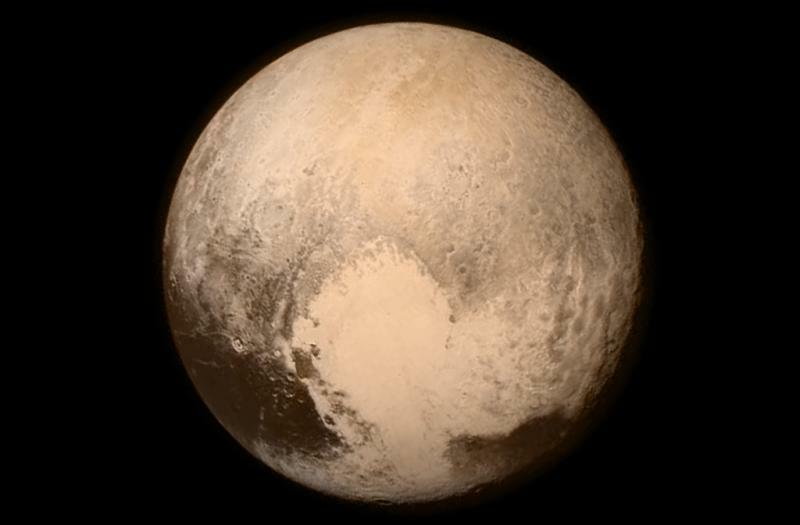 Below is our new look at Pluto, from the New Horizons probe at the time of closest passage. This image reveals geologic features on this icy dwarf planet. The above image comes from the Mars Curiosity Rover, showing prominent veins in sedimentary rocks inside Gale Crater. 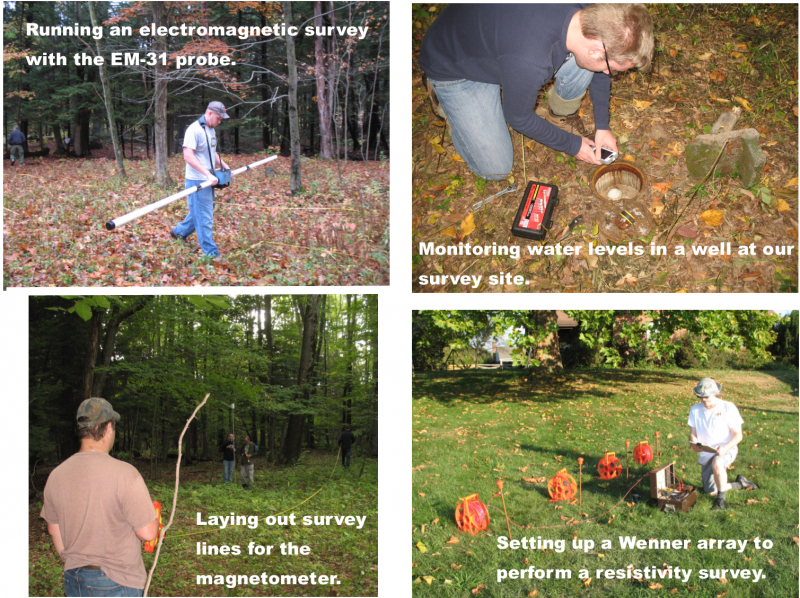 During the term the Geophysics Class characterized a former industrial site using various geophysical instruments, including a magnetometer, electromagnetic probe, resistivity meter, and a seismograph. Coleman, N., 2016. Secondary chaos on Mars produced substantial flooding. 47th Lunar and Planetary Science Conference, Abstract #1054, The Woodlands, TX: (March, 2016). http://www.hou.usra.edu/meetings/lpsc2016/pdf/1054.pdf. ﻿Coleman, N., 2015. Hydrographs of a Martian flood from the breach of Galilaei Crater. Geomorphology 236, 90-108, http://dx.doi.org/10.1016/j.geomorph.2015.01.034. Coleman, N., 2015. Barsukov Crater and its rim-breach channel, Silinka Vallis (Mars). 46th Lunar and Planetary Science Conference, Abstract #1296, The Woodlands, TX: (March, 2015). http://www.hou.usra.edu/meetings/lpsc2015/pdf/1296.pdf. 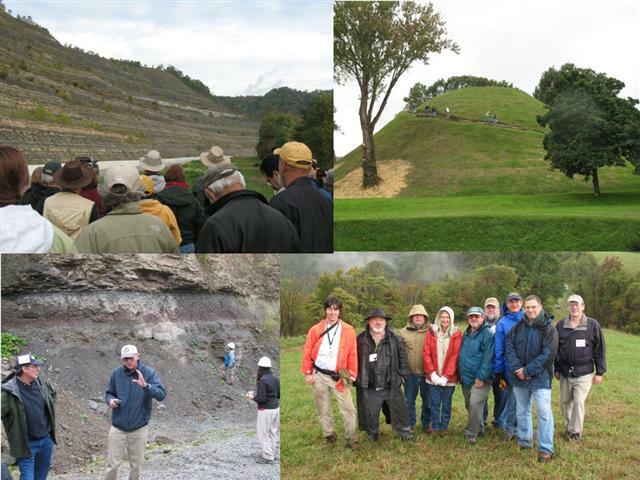 Here are some photos from the 2013 Field Conference of Pennsylvania Geologists, headquartered in Williamsport, PA. Above: Quarry with outcroppings of Marcellus Shale. The discussion is being led by Don Hoskins, former Pennsylvania State Geologist, now retired. 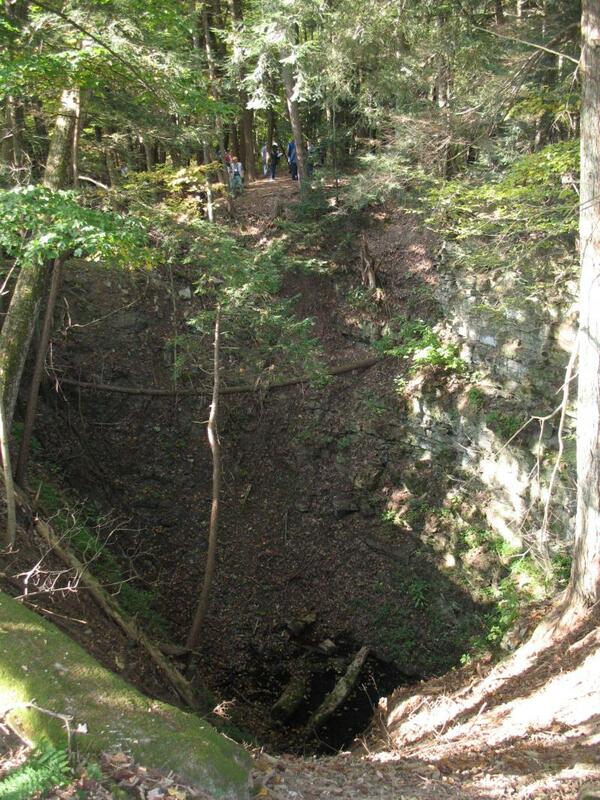 Above: An enormous sinkhole. Note the people for scale at top of image. A relatively new discipline is medical geology, an emerging subfield that studies relations between natural geological factors and their effects on health. The Commission on Geological Sciences for Environmental Planning defines medical geology as: "The science dealing with the influence of ordinary environmental factors on the geographical distribution of health problems in man and animals." Medical geology studies exposure to or deficiency of trace elements and minerals; inhalation of ambient and anthropogenic mineral dusts and volcanic emissions; transportation, modification and concentration of organic compounds; and exposure to radionuclides or pathogens. 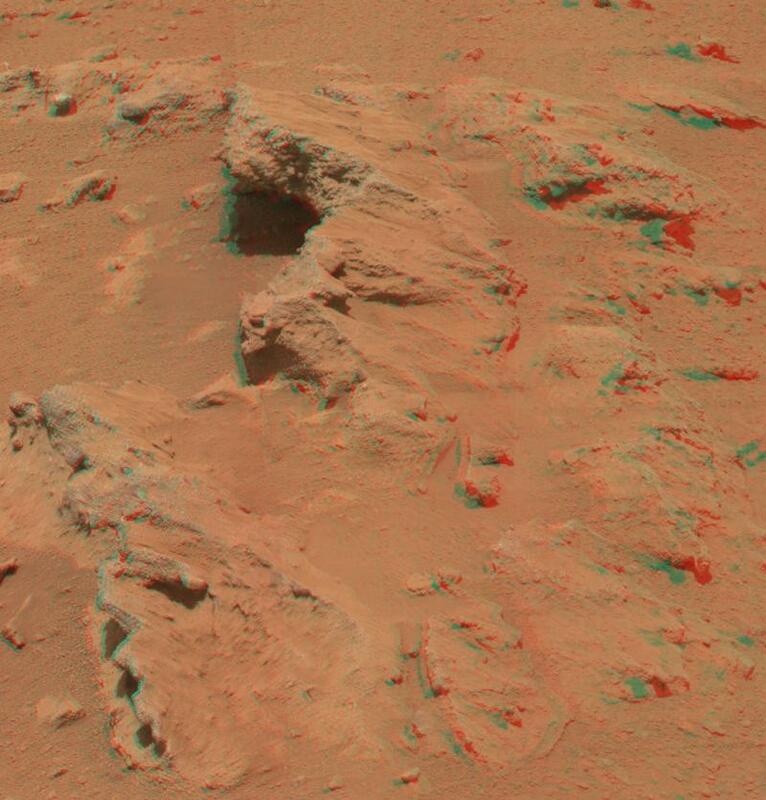 Check out the latest NASA images from Mars! Above - Conglomeritic evidence of a stream bed on Mars! Spectacular stratigraphic layering visible in the slopes of Mt. Sharp. NASA images - Curiosity Rover. A. Artist concept of Curiosity examining a rock. B. Color image from the actual landing, showing separation of the heat shield as it falls away. C. Spectacular image taken by the Mars Reconnaissance Orbiter, showing Curiosity descending on its parachute. D. Image showing a wheel on the surface, with no penetration. The surface must have a relatively high yield strength. E. Closeup view of gravels beneath the rover. 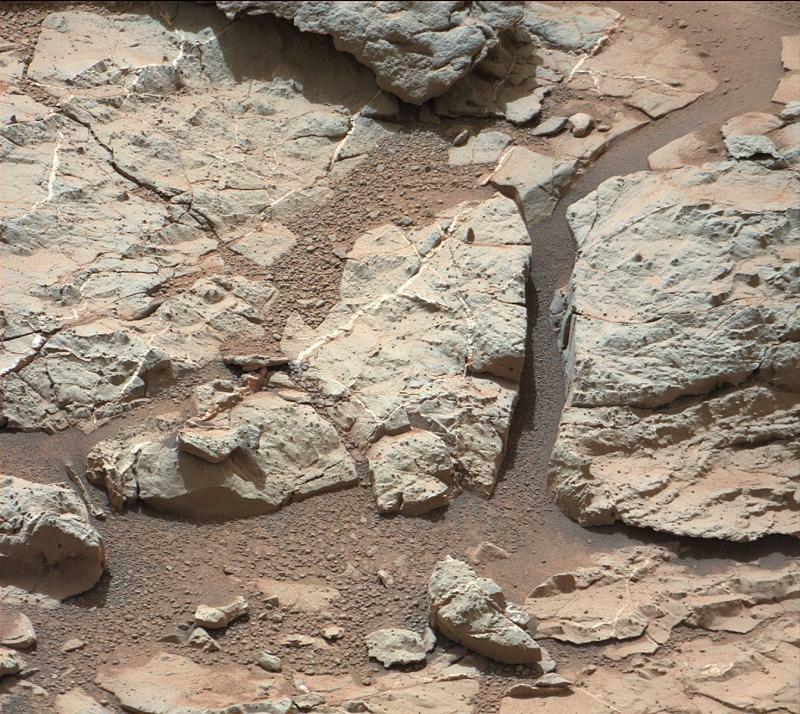 These gravels appear to have been sorted by the action of water, suggesting the landing site in this part of Gale Crater is an alluvial plain. 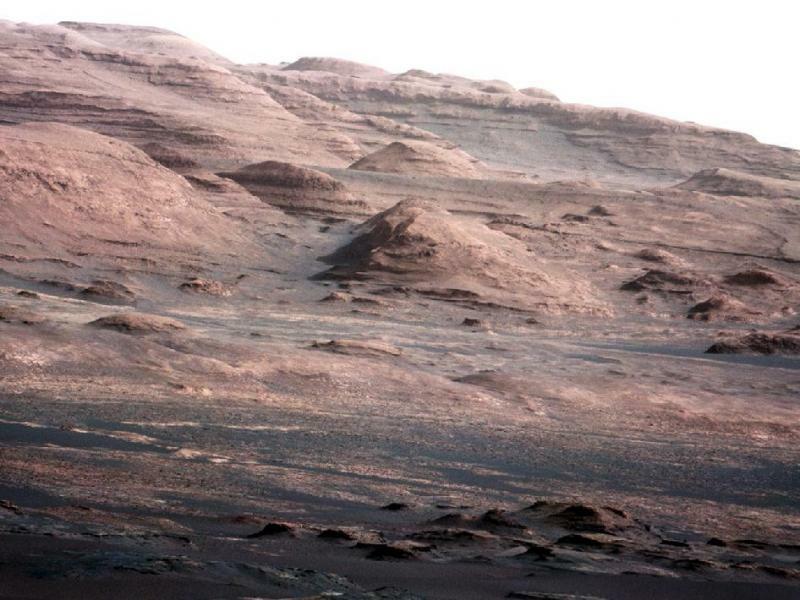 View toward Mount Sharp. Note dark dunes at the base of the mountain. The slopes above are humocky, probably from differential erosion, and show well-defined stratigraphic layers. Here's an excellent YouTube video called Faces of Earth - Building the planet! And check out this video by the Geological Society of America, which explains the value of a career in the earth sciences. See what it's like to be a mineral exploration geologist. 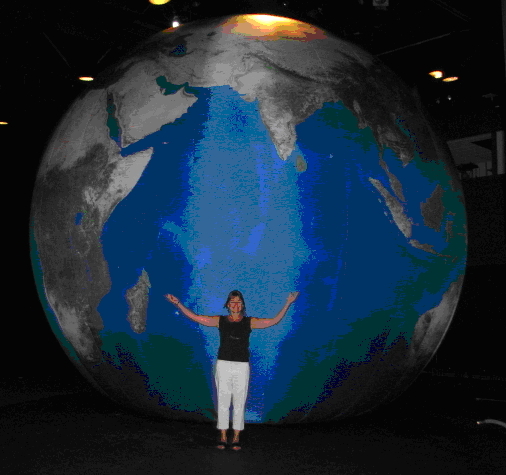 Check out these photos from a visit to the Maryland Science Center. 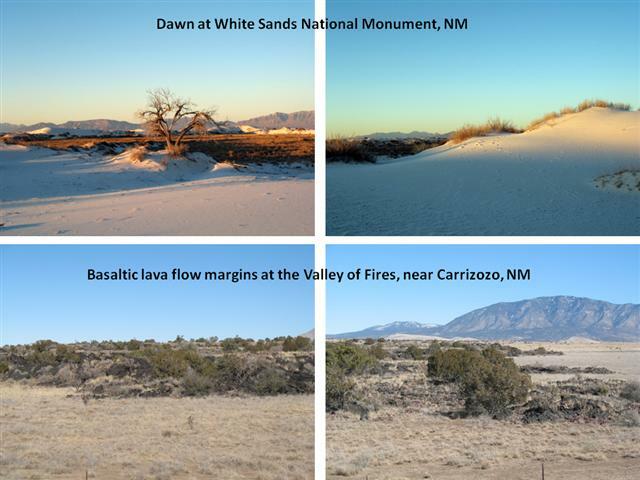 This has been another remarkable year for the Department of Geology and Planetary Science. Check out the kinds of research we've been doing on these pages, including new work on the Johnstown Flood of 1889, energy and climate science, and the hydrology of Mars. Special congratulations to Dr. Katrin Monecke for her continuing research on tsunamis. 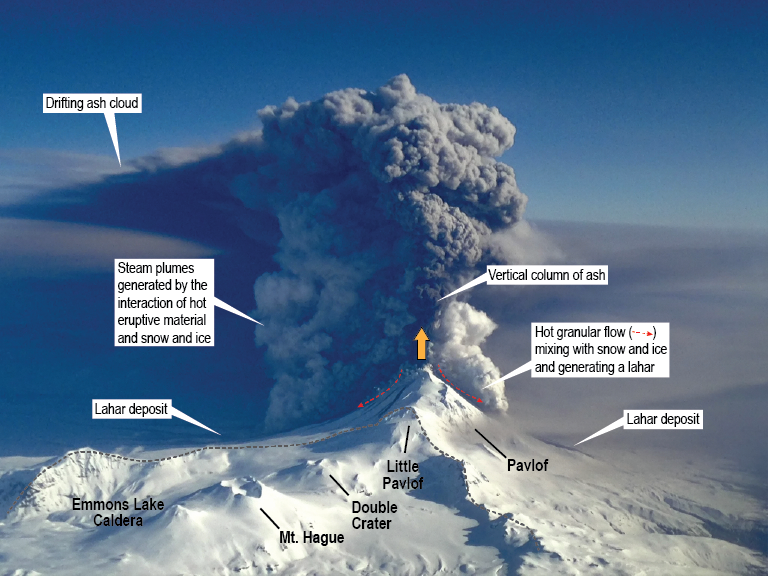 This is a hot topic in Earth science after the catastrophic damage in Japan in March of 2011. See Dr. Monecke's previous article in the journal Nature Monecke et al., 2008, A 1,000-year sediment record of tsunami recurrence in northern Sumatra, Nature, 455, 1232-1234]. Dr. Monecke now teaches at Wellesley College in Massachusetts. We recognize Katrin's wonderful teaching and research contributions to the Department, and wish her continued success in all her future work. 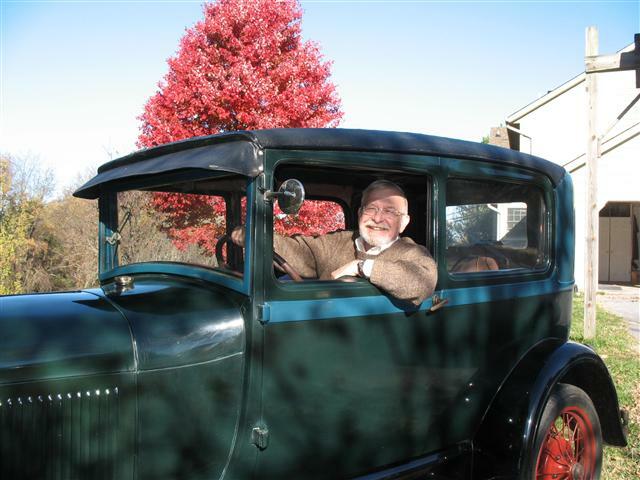 Meet Professor Emeritus William Brice! 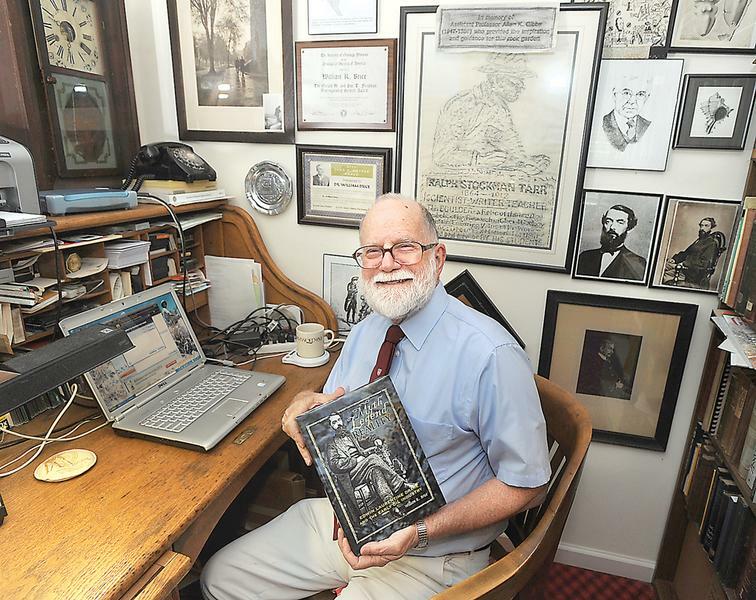 After a long and distinguished career of teaching earth science at UPJ, and many summers teaching at Cornell, this emeritus professor has passionately pursued his writing career. Many students at UPJ, Cornell, and elsewhere have been inspired by his leadership and depth of knowledge in the earth sciences. In 2005 he set off on the great adventure of Semester at Sea, where he joined other faculty and 700 students on board a ship named "Explorer" that circled the globe. In Brazil and South Africa, local geologists presented to the students evidence of the change in sea level over the millennia. Each port call lasted between five and seven days. At each of these ports the students volunteered to help in schools, hospitals, orphanages, and other places. Desmond Tutu, who was awarded the Nobel Peace Prize in 1984, was one of the special lecturers, speaking about his work on the Truth and Reconcilation Commission regarding racial discrimination, or what is known as apartheid, in South Africa. Professor Brice is a member of the Petroleum History Institute and edits their journal, Oil Industry History. 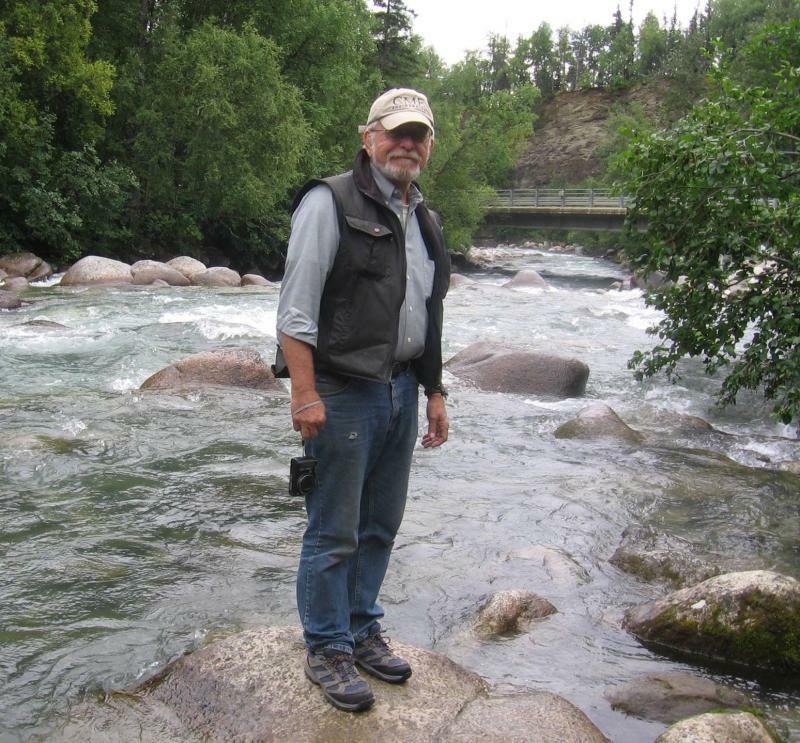 He has published or presented more than 100 articles and papers on the history of geology, history of the oil and gas industry, and biographical studies of geologists. Brice has authored five books, the latest a biography about Edwin Drake. Titled Myth, Legend, Reality Edwin L. Drake and the Early Oil Industry, Brice's book was published in 2009. 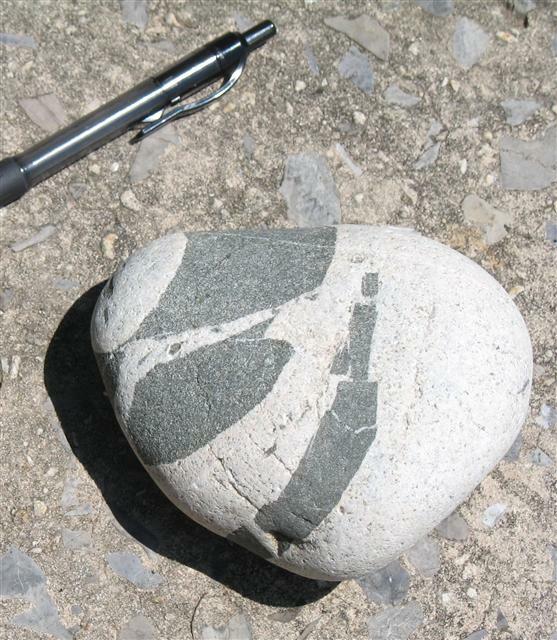 A beautiful, puzzle-piece, fractured dolerite inclusion in a quartz-bearing syenite. This sample was collected from a cobble beach, washed from glacial till on the coast of Campobello Island, New Brunswick. 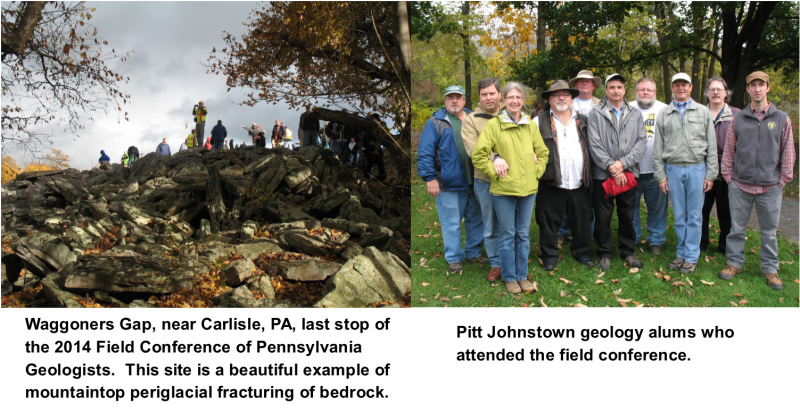 The 76th Annual Field Conference focused on the geology of the Pennsylvanian-Permian Dunkard Basin. 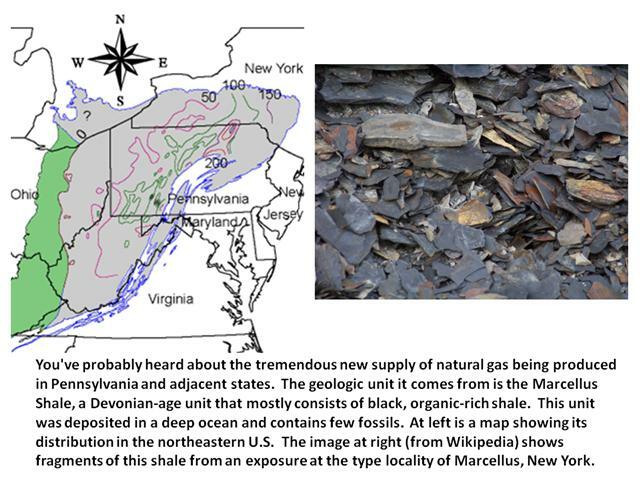 Evidence from plant fossils indicates that the Pennsylvanian-Permian boundary lies within the Dunkard Group. Below are some photos from the conference. Lower right: UPJ alums at the field conference. 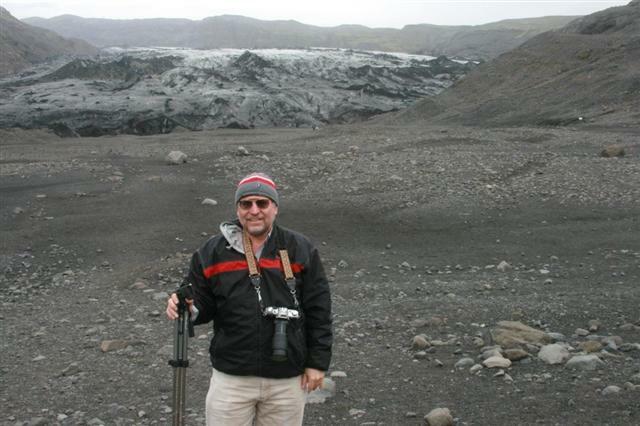 UPJ alum Glenn Johnson at the Solheimajokull Glacier, Iceland. Neil took the following photos on a trip to New Mexico. 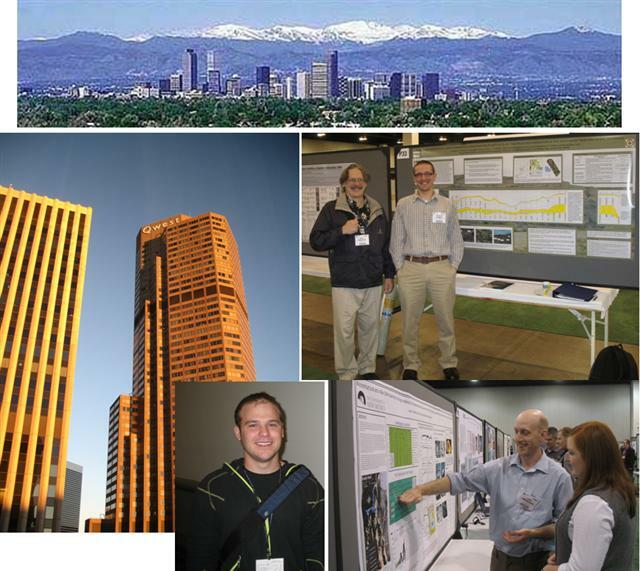 Geophysics Instructor Neil Coleman also attended the 2010 Annual GSA meeting in Denver to give a talk and co-chair a session on phosphate mining. Three UPJ alums who are in graduate school also gave talks at the conference. See pictures below, which include (clockwise from lower left) Reed Myers (Idaho State Univ. ), Neil with Andy Hutsky (Univ. of Nebraska-Lincoln), and Jake McDermott (Univ. of New Mexico). 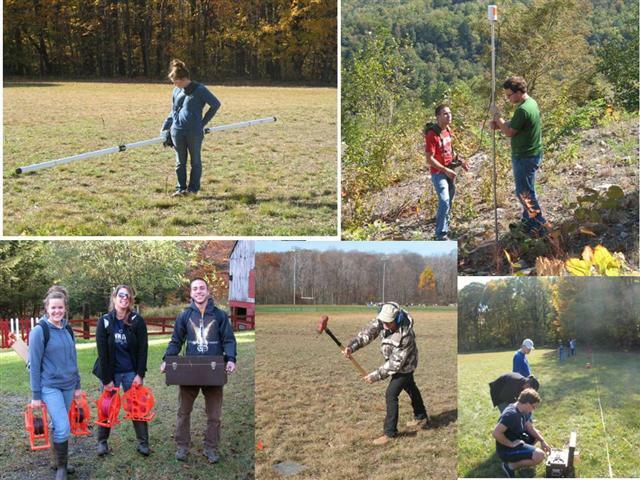 This geophysics class was fortunate to have dry weather for all of our outdoor lab sessions. 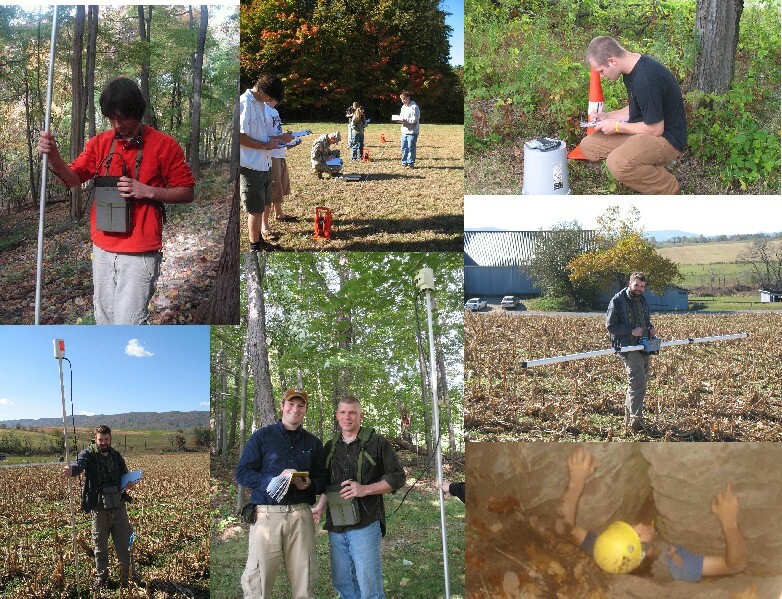 Below are photos of the students in the field. 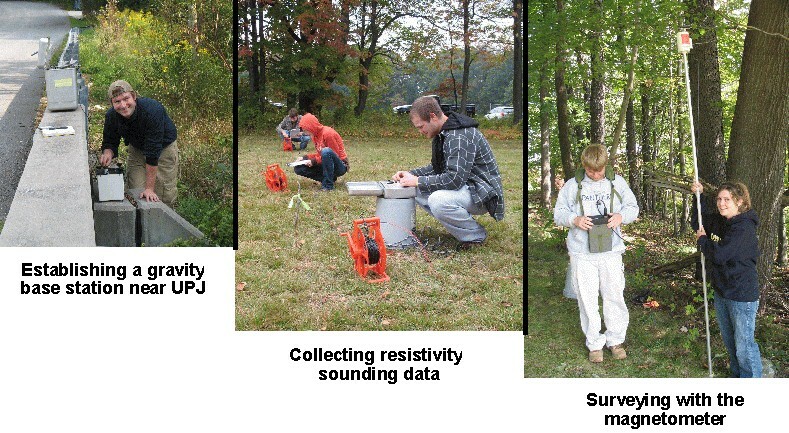 Clockwise from upper left: (1) Heather using the EM-31, (2) Blake and Cameron surveying at a remote site with the magnetometer, (3) a class exercise running a resistivity profile with the R-50 meter, (4) Justin with the seismograph hammer and plate, and (5) Heather, Brianna, and Blake with the resistivity meter. Mars - Does it Have a Magnetic Field? And what has Emeritus Professor Kaktins been up to? Here he is at the helm of a Ford Model A. Along with Neil Coleman he gave a Bromery Lecture at Johns Hopkins University on our latest research on the Johnstown Flood of 1889. 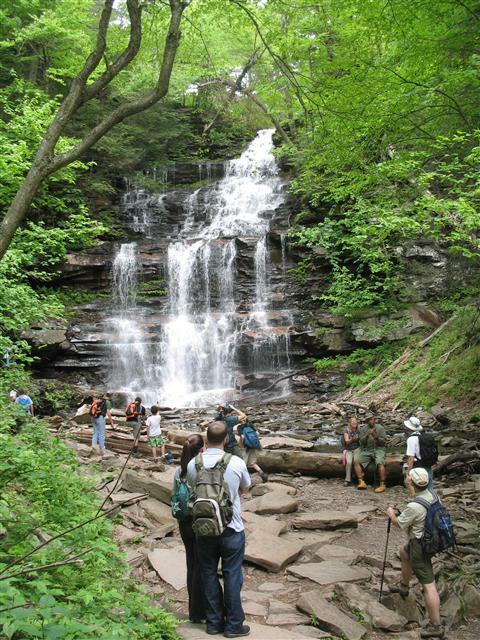 Foot of Ganoga Falls, Rickets Glen State Park, Pennsylvania. This magnificent park, once in the running to become a national park, is not well known in Pennsylvania. Steep trails descend a gorge filled with beautiful waterfalls, and large sections of virgin timber have been preserved. The waterfalls formed when continental glaciers altered the drainage patterns in this area, adding about 7 square miles to the drainage basin. The gradient of the Glens is too steep for the present amount of water flow. The falls are rapidly eroding upstream and will eventually reduce the gradient to the appropriate angle for the size of the drainage basin. Images from our trip to GSA in Portland, Oregon in 2009. At left is Mount Hood, Oregon. At right, a UPJ alum visits the rhythmite section exposed at Burlingame Ravine, near Walla Walla, Washington. This exposure led Richard Waitt (USGS) to propose the occurrence of many Missoula megafloods. Former Professor Monecke and Frank Karmanocky did fieldwork related to tsunami research in Sumatra. Here are two photos. Coleman, N., L. Abramson, and F. Coleman, 2012, Estimated Lag Time in Global Carbon Emissions and CO2 Concentrations Produced by Commercial Nuclear Power Through 2009 with Projections Through 2030, Health Physics, Vol. 102, No. 3, 326-334. Johnstown Flood of 1889. We are conducting new hydrologic research on this tragic event that caused the greatest loss of life from dam break in U.S. history. There are many publications in the popular literature about this flood, but it has received little scientific scrutiny. View from the western remnant of the dam toward the eastern side. This view shows the profile of the former dam. The main spillway location was under the bridge seen in upper part of image. Most people are unaware that an emergency spillway existed on the western side of the dam. Fieldwork at the former South Fork dam, source of the Johnstown Flood of 1889. Left image shows western remnant of dam as seen from center of breach. Right image shows present-day bridge across the old spillway. The damsite is a National Memorial maintained by the National Park Service. He has been aninstructor in the UPJ geology department since 1996. 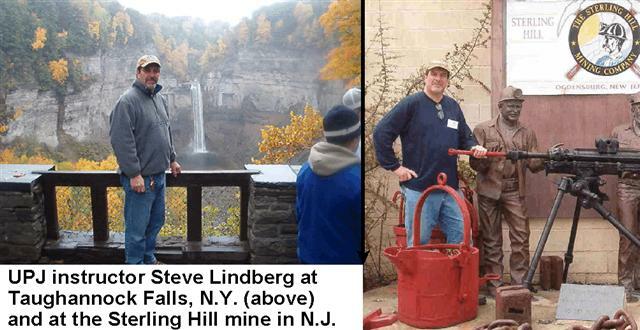 At UPJ Steve teaches Astronomy, Meteorology, and has assisted in the Geologic Field Methods and Geomorphology courses. A graduate of Waynesburg College in Pennsylvania, Steve started his teaching career on Long Island, New York, where he taught earth science at his former high school. In 1984 he moved to Johnstown and began teaching earth science at Westmont Hilltop High School. Steve is retiring from that teaching position this spring - congratulations Steve! Since moving to Johnstown Steve has been an active contributor to many local school district workshops, in-service programs and teacher education programs. In 1992 the National Association of Geoscience Teachers awarded Steve the Outstanding Earth Science Teacher for the state of Pennsylvania. As an active member of NAGT and past NAGT Eastern Section President, Steve currently chairs the NAGT Eastern Section awards committee for the James O'Connor Field Camp Scholarship and the Digman Award; as well as serving as the NAGT State Councilor for Pennsylvania. 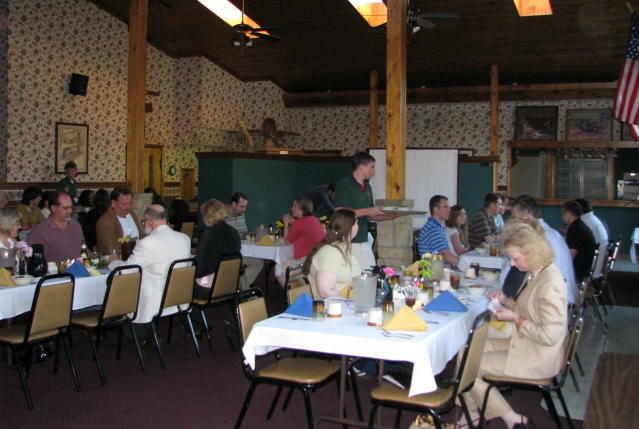 In 1999 Steve coordinated the NAGT Eastern Section conference which was held here at UPJ. Steve has a keen interest in all aspects of the earth sciences; especially general geology and the local geologic and mining history of the Johnstown region. 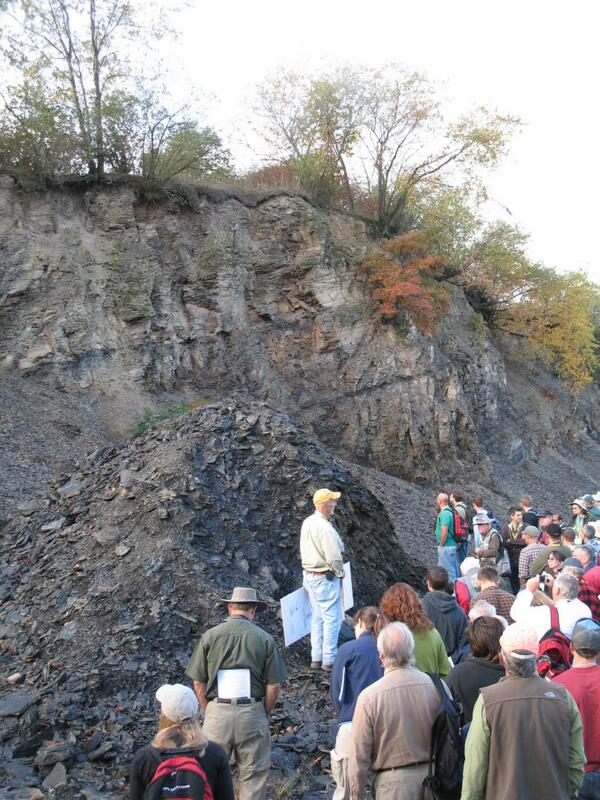 Each fall Steve hosts the annual gathering of Mining Artifact Collectors here at UPJ. Once a year, collectors of mining lamps and mining artifacts from all over the country meet at UPJ to display and discuss the history of mining. Steve's personal teaching philosophy has always been that actual hands-on field experience is one of the best methods by which to instruct students. In his classes at both UPJ and Westmont Hilltop, Steve uses as many practical labs, demonstrations and student-centered activities as possible. 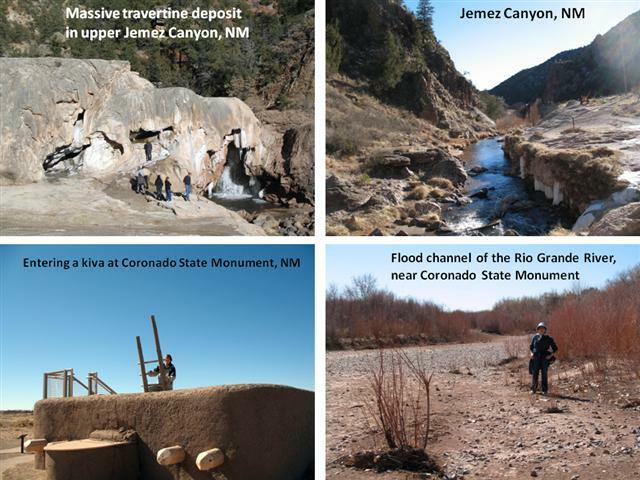 Above photos, clockwise from lower left: using the magnetometer to locate faults; using the magnetometer to search for caves; collecting Earth resistivity data; taking GPS measurements; using electromagnetic gear to locate covered faults in Valley and Ridge terrain; caving! ; and a field exercise with the magnetometer. Congratulations to Frank Karmanocky, whose abstract on gravity base stations has been accepted for publication and presentation at the Northeastern Section Meeting of the Geological Society of America, March 2009. Read his abstract at: http://gsa.confex.com/gsa/2009NE/finalprogram/abstract_155272.htm. 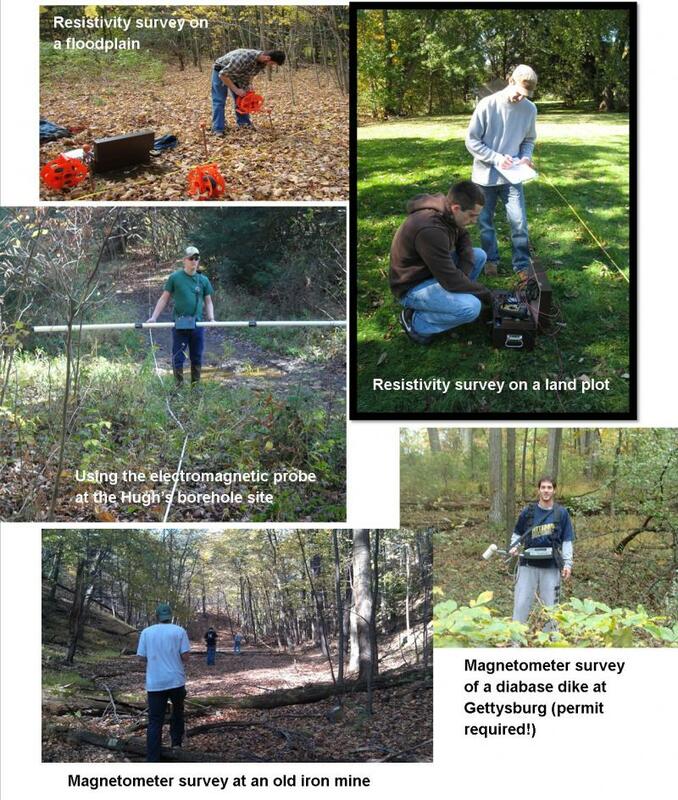 Our thanks to Professor Rob Sternberg of Franklin & Marshall College for loaning us his gravity meter. Congratulations also to Matt Petrowsky and Ry Jones, whose paper has been published by the Lunar and Planetary Institute in Houston, TX. 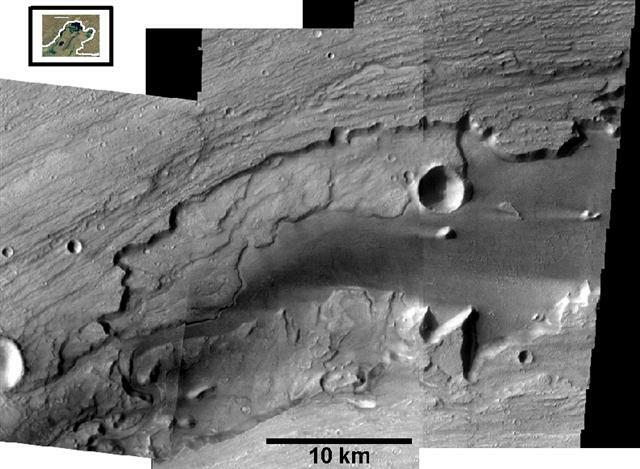 The paper is titled "Structural Deformation and Surface Properties of a Martian Crater - Insights from THEMIS Infrared Images. 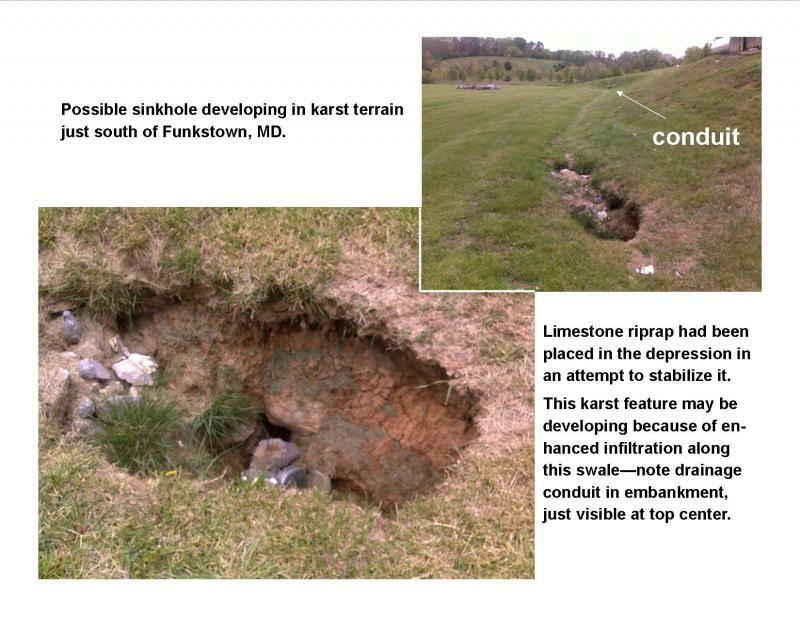 See their paper at: http://www.lpi.usra.edu/meetings/lpsc2009/pdf/1213.pdf. The Martian crater studied by Matt and Ry has been granted a formal name by the International Astronomical Union - it's called "Saravan Crater." One of our Geophysics classes was on Halloween night! 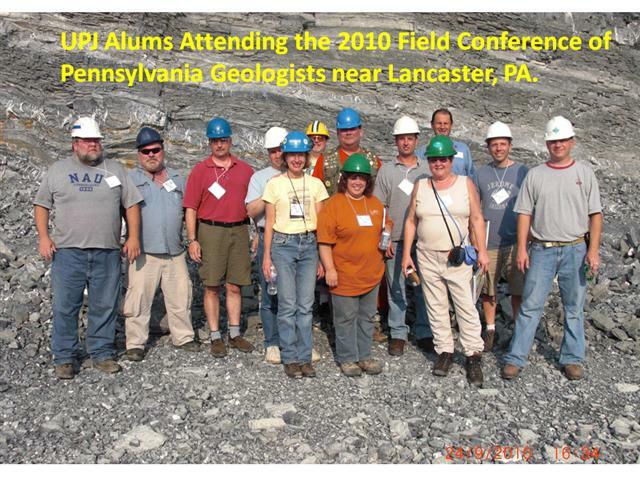 Above - Some of our UPJ Geology Club members from 2008! Above: Nina Kaktins on the beach of the South Island of New Zealand. 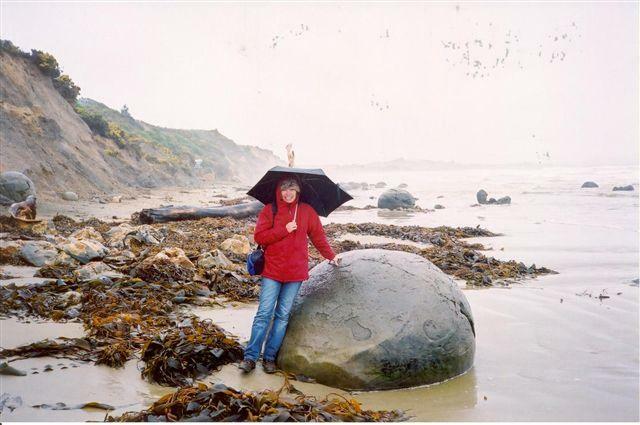 She is leaning on a Moroki boulder, which is a giant concretion. The fossilized remains of a large Cretaceous marine reptile have been found inside one of these boulders. 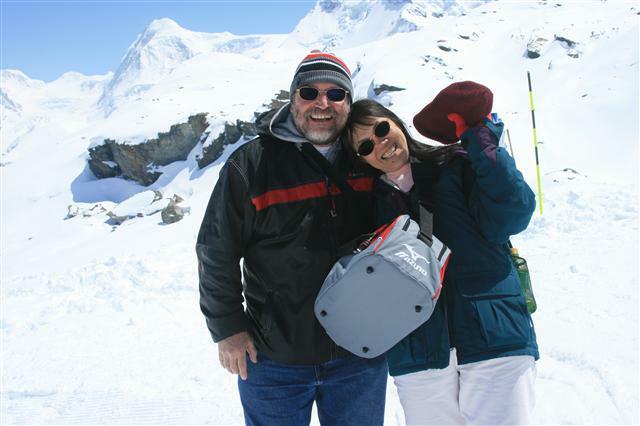 Geology alum Glenn Johnson and wife Choi Cheng in Switzerland at the Klein Matterhorn. This is the highest point in the Zermatt-Cervinia ski area in Switzerland. 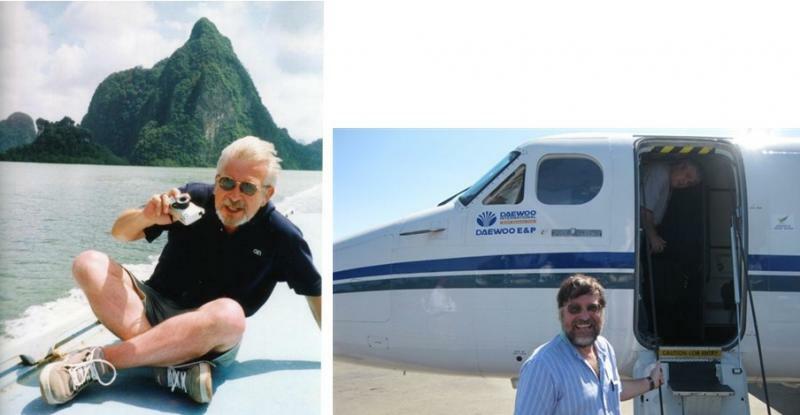 The late Emeritus Professor Kaktins on a trip to Thailand (left). UPJ geology alum Johnson on his way to an oil rig in southeast Asia (right). Meet Teresa McConnell! She graduated from Indiana University of Pennsylvania with a B.S. in Geology and attended Geology Field Camp at Northern Arizona University. For six years she worked in Colorado for Martin Oil Service as an Exploration and Wellsite Geologist. This work included subsurface and geological mapping, wellsite geology, economic and well log analysis, prospect generation and lease evaluations and acquisitions. During many summer months Teresa works with the boy Scouts of America, local school districts, the Learning Lamp and the UPJ Continuing Education department teaching geology and earth sciences to elementary and junior high school children. Ms. McConnell started working full time at UPJ in the Geology and Chemistry Departments in 1987. She has been a part-time faculty member in the Geology department since 1995. Her courses include Environmental Geology, Exploration in Geology, Physical Geology and Oceanography. Teresa has 3 children and is also a part-time figure skating coach and a United States Figure Skating Gold test medalist. 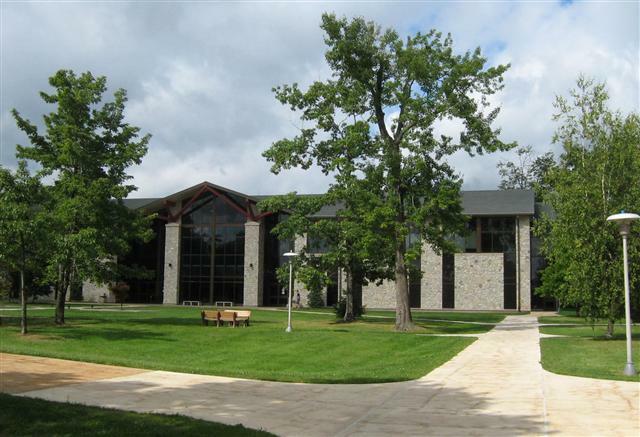 Seasonal views of the UPJ campus in the Laurel Highlands. Summer (top), March (left) and December (right). UPJ has a cross-country ski trail for use by students, faculty, and staff. Copyrighted - in trust for UPJ Geology alums and students. 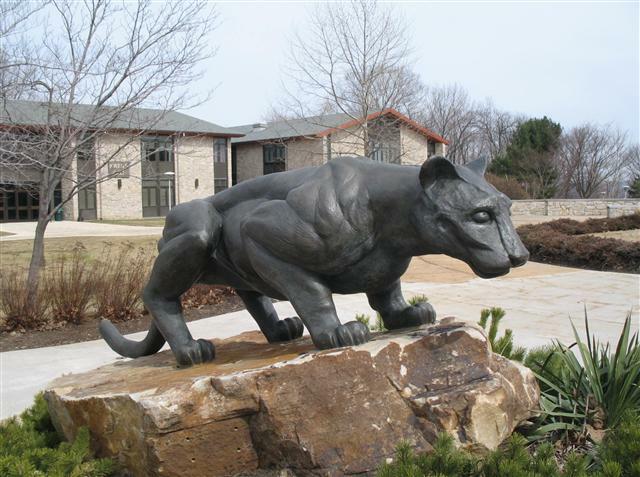 We are a website dedicated to UPJ Earth Science alumni and students. Student and alum activities and links to publications may be found here. Copyright 2012 UPJ Student and Alumni Website. All rights reserved.